If you want to cook perfect rice — the kind that always stays light and fluffy, with absolutely every grain remaining separate — then we can teach you. But first you will have to make a promise, and that is to memorise three simple little words: leave it alone! If you can do this you will always be able to cook long-grain rice perfectly, and never have to worry about it. The number one enemy of fluffy, separate rice is the wooden spoon or, more specifically, the anxious cook who wields it. It is nervous prodding, poking and constant stirring that ruins rice. So there you are — that's the basic principle for the most common type of rice you'll have to cook, long-grain rice, but, of course, there are other kinds of rice that need different kinds of cooking. So for the beginner it's crucial to know your rice before you attempt to buy or cook it. The simplest approach to rice cooking is to think in terms of four types of eating categories: first there's the fluffy, separate kind we've talked about; secondly there's the creamy, soupy kind used in risottos; then the clingy, sticky kind used in the Far East; and lastly what I'd call speciality rices, which have a distinctive characteristic of their own and are therefore not really in any of the categories already mentioned. Grains of rice, like wheat grains, are sometimes milled, which means the germ and the outer bran layer are removed in the process, revealing the inner grain, which comes in different shades of creamy white to pure white, depending on the variety. If the bran and germ are left intact, the colour of the grain is a rather appealing greeny-brown — hence the name brown rice. Here the flavour is more pronounced, slightly nutty and the texture is less soft, with more bite than white rice. The advantage is that this rice contains (as you'd expect) more fibre, vitamins and minerals, but it takes longer to cook: 40 minutes as opposed to 15. But it's good to ring the changes, and there are times when I personally prefer brown to white rice for serving with certain dishes —with chilli, for instance, or in a rice salad. On the other hand, if I'm serving curry, I always prefer white rice, but it's good to experiment to find out what your own preferences are. What usually determines the 'eating' categories is the shape of the grain (although there is the odd exception, as you will see later). Long-grain rice is precisely that, and the longer and thinner the grain is, the better the quality. 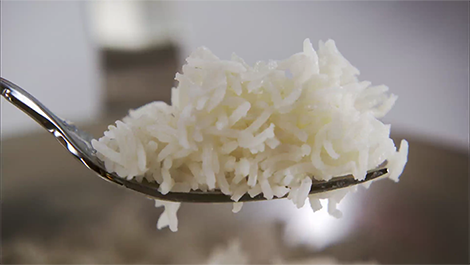 So the grains should be mega-slim, with needle-sharp points at each end: this is the type of rice needed for separate, fluffy grains, and the best quality is called basmati. This is more expensive than others, but since cooking is about flavour, it is the one to buy, as it has a far superior taste. Although you will see dozens of varieties of long-grain rice, I believe it's well worth paying that little bit extra for basmati. Whether you are using the brown or the white, it's quite certainly the best. Here the grains are not long and thin, but rounder and plumper. This group comes in the creamy and sticky eating category described earlier. Risotto rice varieties include arborio, carnaroli and vialone nano. In creamy, almost soupy risottos the rice is stirred, which releases some of the starch, and it is this that creates the lovely, smooth, creamy mass. The same kind of plump grain is used in Spain, and one of the finest varieties comes from the Valencia region and is called calasparra, which is used to make paella, though here the grains are not stirred, so they remain firm and distinct but with a moist, creamy edge. In Japan there are several varieties of short-grain rice, ranging from the mildly sticky to the very sticky rice used to make sushi (it makes absolute sense that in the countries where chopsticks are used, rice with a stickier, more clinging consistency is far more manageable). This is sometimes called `glutinous' rice, but it does not, as its name might suggest, contain any gluten and I prefer to describe it as sticky rice, which is more accurate. In Thailand and Southeast Asia the rice grown and preferred is sometimes called jasmine or fragrant rice, but again I think the title is a little misleading, because it isn't actually any more fragrant than other types of rice. However, the quality is very good, and though it's actually a long-grain rice and when cooked, the grains have a firm texture and a good bite, they have a faint stickiness and tend to adhere to each other. I would say in this case the rice is both fluffy and sticky, and this is how it should be. These are rice varieties with their own individual characteristics. The first is Camargue red rice. Though other red rices are grown in America, this one, from France, is of superior quality. It is an unmilled short-grain rice with a brownish-red colour, and I would describe its character as earthy and gutsy, with a firm, slightly chewy texture and a nutty flavour. It is excellent in salads and combined with other strong flavours. Because it is a short-grain rice it is very slightly sticky when cooked and not meant to be separate and fluffy. Black rice, well, it's reddish black, is an Asian rice used for sweet dishes and puddings and turns purple when cooked. It's probably about to become as fashionable here as it is in Australia, where practically every smart restaurant has a special pudding made with cooked black rice dressed with a mixture of palm sugar, coconut milk and lime. If you manage to get some, follow the instructions on the packet, which vary. Wild rice is not actually a rice grain at all but the seed of a special type of grass grown in the swamps of North America. However, it's called rice, so I've put it on my list because it is cooked and served in exactly the same way, but needs about 50 minutes. The seeds are very long and most attractive, with a shiny ebony colour, and have a subtle, smoky, nutty flavour. It's good in salads and with gutsy foods with strong flavours. When cooked, the seeds tend to burst and split slightly, but this is quite normal and not some failure in the cooking — though, as with rice grains, it's important not to overcook them. There are, of course, a million and one types of rice, and the list I've given you has what I believe to be the best in quality. The 'also rans', in a way, perpetuate the myth that cooking rice is difficult, and people usually buy them out of fear. Hopefully, our cookery school will dispel the myth and we can all enjoy the best quality of flavour when we're cooking rice. Pre-cooked or par-boiled rice is actually cooked before milling: this means the grains are tougher so require more water and a much longer cooking time. This is to help it stay more separate, but in my opinion there is a loss of flavour and I would never choose it. Quick-cook or easy-cook rice has been partially cooked after milling and then dried, so all it has to do is reabsorb water. It is quicker to cook, only 8-10 minutes instead of 12-15, but the loss of character and flavour puts this in the 'sliced white' category, ie, dull and pappy. 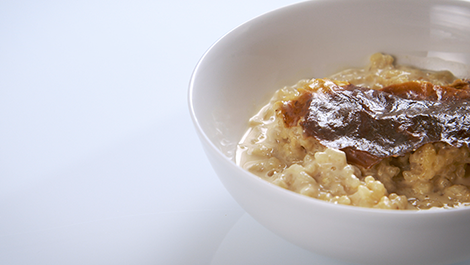 Since I was a small child — a long time ago — we have always had in Britain a variety of short-grain rice called pudding rice; this is the type used the world over in sweet dishes and is best of all, in my opinion, for good Old-Fashioned Rice Pudding. It is very sticky when cooked and, simmered in milk, becomes deliciously soft and creamy. I have never washed rice since I discovered that it is possible to wash away some of the nutrients in the process, and in any case modern rice is thoroughly cleaned in the milling. What's more, the water it's cooked in will be boiling, and that, of course, will purify it. I think some of the traditional methods of cooking rice, which require long rinsing and washing, belong to past times, when the rice was not as clean as it is today. Always measure rice by volume and not by weight. Use a measuring jug and measure 2 fl oz (55ml) per person or 4 fl oz (110ml) for 2 or 8 fl oz (225ml) for 4 and so on. Coating the grains of rice in a little oil before adding the water can help to keep them separate, and adding a little onion can provide extra flavour. But this is not a necessity — rice can be cooked quite simply in water. The quantity of liquid you will need is double the volume of rice, so 4 fl oz (110ml) needs 8 fl oz (225ml) of water or stock. Always add hot water or stock. Don't forget to add salt, about ¾ teaspoon to every 4 fl oz (110mls) of rice. The very best utensil for cooking fluffy, separate rice is a frying pan with a lid. Over the years I have found that the shallower the rice is spread out during cooking the better. Our Delia Online Little Gem frying pan is perfect for two portions or for four portions you will need a frying pan measuring about 25.5cm on the base. Either way you will need a tight fitting lid. Once the hot liquid has been added, stir once only, cover with the lid and turn the heat down to its lowest setting, Give white rice 15 minutes and brown rice 40. Leave it alone! Once the lid is on, set the timer and go away. If you lift the lid and let the steam out you can slow down the cooking process, and rice should always be cooked as briefly as possible. Even worse, if you stir it you will break the delicate grains and release the starch, and then it will end up sticky. Use a timer — overcooking is what spoils rice. The best way to test if it is cooked is simply to bite a grain. If there is any liquid left at the end of cooking time just put the lid back on and give it another minute. When the rice is cooked, remove the lid, turn the heat off and place a clean tea cloth over the pan for 5-10 minutes. This will absorb the steam and help keep the grains dry and separate. Just before serving, use a fork or the tip of a skewer to lightly fluff up the grains.